“A new day will come / a new sky, a new land, new fresh air / and on this day, the oppressed / freedom in unison will chant.” The words were heard outside the Supreme Court building in the capital city of Brazil, Brasília, where an interreligious rally to support ex-president Luiz Inácio Lula da Silva’s freedom was being held. To support the seven activists from people’s movements who have been staging a hunger strike for more than two weeks, religious believers and other supporters came together to demand Cármen Lúcia, the chief justice of the Supreme Court, move three petitions – called ADCs – that question the imprisonment of defendants while their cases are still appealable. This is the case, for example, of former Brazilian president Lula, who has been in prison since Apr. 7. Demonstrators lighted candles and the Capuchin friar Wilson Zanatta talked about how light symbolizes people's hope that the ex-president will be freed. “We want to hear those words so that the word of God can enlighten us, brighten us up, so that we can be sure where we are going and what we are building,” he said during the celebration, about the chants demonstrators were singing. Another supporter who took part in the rally was Maria Fernanda Coelho, a former president of state-owned bank Caixa Econômica Federal. She commended the activists who are depriving themselves of food to protest against Lula’s imprisonment. “I understand that what they are doing is peaceful, yet very powerful, and you have to have so much love in your heart to make a decision like this,” she said. Not only ex-president Lula, but also around 150,000 people are imprisoned while their case is still pending appeal. 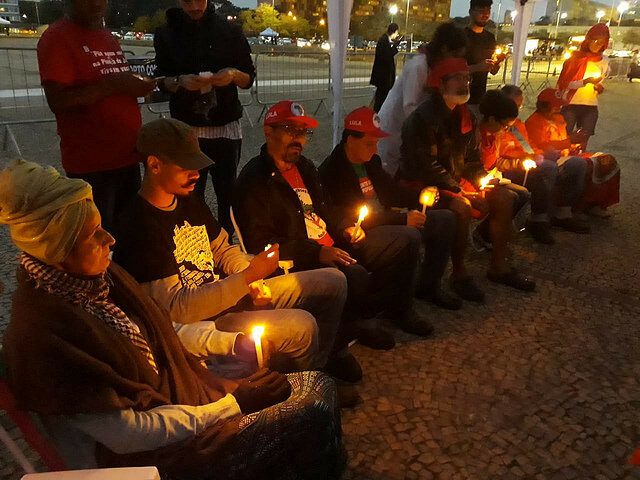 João Pedro Stedile, from the national board of the Landless Workers’ Movement (MST), spoke about how important it is for chief justice Cármen Lúcia to give top priority to the matter. Three similar ADC petitions were filed with the Supreme Court, one of which by the Communist Party of Brazil in April.